One of the most moving portions of my trip was engaging with the people of India. When they look into your eyes, they see your soul. They don’t glance away. They look deeper. There is a genuine desire to “know” you and honor the divine in you, thus where the word Namaste comes from. As part of SHEROES United, I got the privilege to go into the Himalayas and bring Humanitarian relief. But honestly, visiting them, I got humanitarian relief. Relief that there are still such genuine, kind, loving people in the world. These are people who are gracious and grateful for the smallest of blessings. After we spent time with the children (a beautiful earlier post), we received the beautiful blessing of meeting the moms of the kids, plus other women who had heard of our arrival. Our wonderful Drum Goddess, Katie Jo, pulled out her drums and then we were off to an adventure of bringing the beauty of sound to the village women. One woman would strike the drum with a small stroke, and Katie Jo would encourage them to strike it hard. The sound then filled the room and soon the dancing broke out, and we saw the women’s hearts soar with the beats. What a wonderful sight to see these women laughing and dancing with so much joy. We gave the drum to the grandmother who really encouraged all to dance. But the most beautiful sight of all was when I looked to the back of the room to the faces of the sons and grandsons of the woman who had witnessed their moms and grandmothers dancing in spirit. What a sight to see! I will forever be changed getting the honor and privilege of being a part of watching spirits soar. Categories: #ilivepoetry, beauty, blessings, GOLD in the SOUL, Uncategorized | Tags: #india, #iwrindia, beauty, blessings, GOLD in the SOUL, Ilivepoetry | Permalink. India was a spiritual buffet, a great feast for the soul. There were so many new tastes and smells and sounds and heart tuggings in one space. One must venture out of their own back yard often. Where to begin? Ahhh, that is a most spicy question with so many answers! There is so much to say and only so much time to write. I’ll start with my favorite and let the words pour from my soul. There is enough juicy material for a very long time. Our group started the adventure as a way to work on our books, to experience and support one another. We ended up writing new chapters in our own life stories…One of our goals was to meet the children in the Himalayas and bring supplies to the homes of the people. Upon first sight, I fell in love. There is so much GOLD in the SOULS of the children. Their hearts are so tender an and full of hope. Their thoughts are on what they have, not what they lack. The first thing they did was sing a song of “We Shall Overcome.” The sweet sounds of innocent voices aware of their situations but not letting it hold them down was uplifting and even enlightening. Their music sounded like an angels choir. Nothing is sweeter to my ears than the sounds of children gathering to sing. My heart was full. Then they sang their national anthem, while a young man full of passion and vigor beat a drum in accompaniment. When the children heard the drums, their smiles grew wide and they belted the song even more. After the song, each of the children got to beat the drum. Sound is a powerful, soul changing tool. I watched in amazement as each child first did a light tap on the drum, and then a strong beat that bellowed a big sound. BOOM! I witnessed the empowerment that the drum sound gave to each child. A shy, timid, young girl sat taller in her chair that day. Then I was so blessed to teach them a hand game learning patterns and rhythms. Kids love these games, and I was reminded of my love for “playing” with the children…sometimes forgotten in a public education back in the states because of rigorous curriculum. The teachers were gracious to give us their time, and the head master said one of the first things he wanted to do was buy a drum for the children. They were elated! There was much gratitude as we passed out the stickers and books we had brought. For them, it was like Christmas. I was in deep gratitude knowing that the gently used books I brought would be cherished, and we had not only made a small contribution toward their education, but we brought smiles and built a bridge. Categories: #ilivepoetry, blessings, GOLD in the SOUL, joy, life lessons, Uncategorized | Tags: #india, #iwrindia, blessings, GOLD in the SOUL, Ilivepoetry, joy, making a difference, school children | Permalink. I didn’t like your kind. Didn’t want to love you or even like you. But you had your charm… your way of working into a heart with subtlety. you have given me hope for the world. Categories: blessings, Discoveries, GOLD in the SOUL, poetry | Tags: cats, love, search for the gold, unlikely love | Permalink. For those of you who know me, I’ve been working to get to know my dad for quite some time. I hadn’t realized it was this long. He passed in March, and as we were cleaning things, I found this journal with only 2 entries (above) that were written, a year or so llater. I never knew he had even written anything in that journal… And now, 14 years later, his words mean so much more to me. 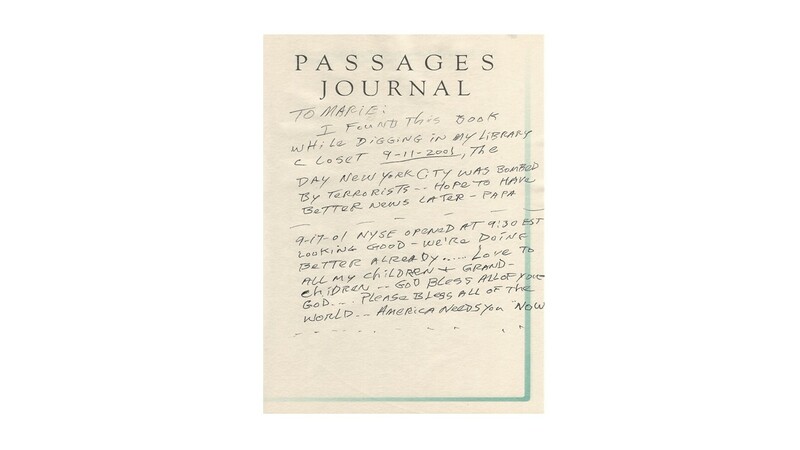 Below are two of his journal entries if you’re not able to read the above. There’s so much that I notice here! Without knowing, I use ellipsis all the time and didn’t know why except that I like that kind of pregnant pause. I must have learned that from him or at least picked it up by watching him. Seeing it in this journal was super cool. Another thing I noticed was that since his death, I have found little notes like this. He often thought about us and prayed for us, even though we never knew it. The VAULT speaks on paper….I’ve probably not said this before, but when we were younger, my dad wrote a lot…and I know that my desire to write comes from watching him spend much time doing this. I do wish he had done it a little more because he was so good at little quips of history and dating everything! (newspaper articles, cards, letters, etc.) I don’t date things enough, but know its value. So the advice I leave with you there is so much we don’t know about a person. It takes time to “find gold in the soul.” Sometimes it takes years for the intimacy to appear. Notice…learn…be patient…and just enjoy…Little things will be revealed in their own time. God Bless America and its beautiful people on this day and years to come. I LOVE YOU so much AMERICA!!! Categories: blessings, Daddy and me, GOLD in the SOUL | Tags: #travelacrossAmerica, 9-11, blessings, gold digging, gold in the soul, Remembering 9-11 | Permalink.